All Critter Squad Wildlife Defender Educators will arrive at least 15 minutes early to your event location in order to unload all of the animals and equipment in a timely manner. We ask that you PLEASE be considerate of our educators and help us out by ensuring an available PARKING SPACE as close as possible to the location of the show. We thank you for helping our Critter Squad Wildlife Defender educators prepare to start your defender package on time! We have tons of fun at outdoor defender events, however, we require the event space to be at least partially shaded for the health of our amazing education animals. Particularly in the summer Southern California months, our animals will overheat and become ill if they are not given some shade. Please keep this in mind — you and your defender guests will surely appreciate our show much more as well! When living in Southern California there is always a chance of it being really hot, especially in the summer. Critter Squad Wildlife Defenders require that all animal defender packages be done inside when the temperature outside, is above 90 degrees. Even with adequate shading there is still chances of the animals over heating when it is above 90 degrees outside. Please keep your eye on the temperature and have an alternative location for your defender party if it is to hot. Our Critter Squad Wildlife Educators will arrive before your event start time to unload and will also stay after to pack up and of course, clean up. To not exhaust our animal educators and to help them respect your time, we ask that your be considerate of the distance needed to load/unload the animals to and from your space. Especially with larger and heavier animals, our animal educators will have a difficult time to load/unload animals in a safe and timely fashion, when walking long distances or taking stairs to reach your event. This will help to save energy for your Critter Squad Wildlife Defender educator and help make the event even more fun and exciting! Gratuities are not required but GREATLY appreciated. Please remember our Critter Squad Wildlife Defender educators work very hard to make sure your birthday defender and defender guests have the best party experience. We love taking our educational animals all around the San Fernando Valley, the Greater Los Angeles Area, the Beach Cities, and even Orange County! We will travel far and wide to help you make your party spectacular! In order to do so, all Critter Squad Wildlife Defender events are subject to traveling fees. We add a $.85 cents per mile traveling fee calculated from our location in Tarzana, California to your event location. All traveling fees will be added to your final invoice total. TO CANCEL AN EVENT, YOU MUST CALL US (818-654-9433)! WE DO NOT ACCEPT ANY OTHER FORM OF CANCELLATIONS. If you cancel within 3 days of your event, we cannot fill your space. Therefore, you WILL and ARE still responsible for your entire invoice, so PLEASE CANCEL IN A TIMELY MANNER! We thank everyone for their business and we will gladly travel anywhere to put on an amazing defender event for you! As you have already learned we charge a .85 cents per mile traveling fee round trip to your location, but when you are located farther than 25 miles away from our facility you may NO LONGER book any 30 minute defender presentations. All your defender presentations must be at least 1 hour long. County fees were a really hard rule for us to put in place here at Critter Squad,Wildlife Defenders, but we love our customers and hate telling them “No, that’s too far for us to travel.” The county fees are in place for shows that are farther than our normal travel distances and are meant to help cover the cost of the massive travel time required for some of these locations. If you are located in the following counties, the following fees will be added to any booking in these counties. We get many customers wondering if we do our defender presentations at parks and rec centers and the answer is, YES! We can do events at parks and rec centers, but there is sometimes additional requirements that MIGHT need to be met. 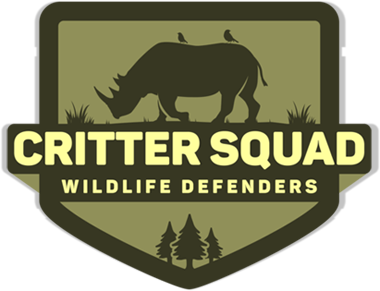 Critter Squad Wildlife Defenders can gladly help with anything that parks and rec centers might need, which may include a copy of a business license, insurance proof or any valid animal permits. If these are required for your event, please send an email to gowild@crittersquad.com with a list of everything you may need. Some things like additional insured certificates, vet letters, and day permits may require additional fees. ANY AND ALL ADDITIONAL FEES WILL BE PAID DIRECTLY BY THE CUSTOMER BEFORE OUR EVENT WILL TAKE PLACE. If a customer did not properly inform the park or rec center about the Critter Squad Wildlife Defenders arrival, the Critter Squad Wildlife Defenders may be asked to leave. If we arrive at a defender event and are asked to leave the customer will still be billed for the FULL BALANCE. Additionally insured certificates can be added to any defender school events and other defender programs. Additionally insured certificates for defender events cost $100 for all events. If the event is going to be large then the quote may change. If additionally insured is required then please call our main office at (818) 654-9433 to setup up a quote. We will inform you about your quote details before any finalization will be completed. ANY AND ALL FEES FROM ADDITIONALLY INSURED MUST BE PAID BY THE CUSTOMER BEFORE THE ADDITIONALLY INSURED CERT WILL BE IN PLACE. Final payments for your defender events can be paid through check or credit card. Critter Squad Wildlife Defenders DOES NOT ACCEPT CASH for any events. Final payments for defender events MUST BE PAID IN FULL and can be accepted ON or BEFORE THE DAY OF THE PARTY. Payments submitted on the day of the party it MUST BE PAID BEFORE the party begins. PLEASE REMEMBER- Critter Squad Wildlife Defenders no longer accept cash! We totally get that many defenders want to feed the animal ambassadors when we are out at your defender event, but Critter Squad Wildlife Defenders do not allow any feeding of the animals while we are out at your defender event. There are a handful of events in which you may purchase the food bag party add-on, so be sure to check out the party add-ons page for more details.